Scurvy is a disease resulting from a lack of vitamin C (ascorbic acid). Early symptoms include weakness, feeling tired, and sore arms and legs. Without treatment, decreased red blood cells, gum disease, changes to hair, and bleeding from the skin may occur. As scurvy worsens there can be poor wound healing, personality changes, and finally death from infection or bleeding. Typically, scurvy is caused by a lack of vitamin C in the diet. It takes at least a month of little to no vitamin C before symptoms occur. In modern times, scurvy occurs most commonly in people with mental disorders, unusual eating habits, alcoholism, and older people who live alone. Other risk factors include intestinal malabsorption and dialysis. Humans and certain other animals require vitamin C in their diets to make the building blocks for collagen. Diagnosis typically is based on physical signs, X-rays, and improvement after treatment. Treatment is with vitamin C supplements taken by mouth. Improvement often begins in a few days with complete recovery in a few weeks. Sources of vitamin C in the diet include citrus fruit and a number of vegetables such as tomatoes and potatoes. Cooking often decreases vitamin C in foods. Scurvy currently is rare. It occurs more often in the developing world in association with malnutrition. Rates among refugees are reported at 5 to 45 percent. Scurvy was described as early as the time of ancient Egypt. It was a limiting factor in long distance sea travel, often killing large numbers of people. During the Age of Sail, it was assumed that 50 percent of the sailors would die of scurvy on a given trip. A Scottish surgeon in the Royal Navy, James Lind, is generally credited with proving that scurvy can be successfully treated with citrus fruit in 1753. Nonetheless, it would be 1795 before health reformers such as Gilbert Blane persuaded the British Royal Navy to routinely give lemon juice to its sailors. Early symptoms are malaise and lethargy. After one to three months, patients develop shortness of breath and bone pain. Myalgias may occur because of reduced carnitine production. Other symptoms include skin changes with roughness, easy bruising and petechiae, gum disease, loosening of teeth, poor wound healing, and emotional changes (which may appear before any physical changes). Dry mouth and dry eyes similar to Sjögren's syndrome may occur. In the late stages, jaundice, generalised edema, oliguria, neuropathy, fever, convulsions, and eventual death are frequently seen. A child presenting a "scorbutic tongue" due to vitamin C deficiency. A child with scurvy in flexion posture. Photo of the chest cage with pectus excavatum and scorbutic rosaries. Scurvy, including subclinical scurvy, is caused by a deficiency of dietary vitamin C since humans are unable to metabolically make this chemical. Provided diet contains sufficient vitamin C, the lack of working GULO enzyme has no significance, and in modern Western societies, scurvy is rarely present in adults, although infants and elderly people are affected. Virtually all commercially available baby formulas contain added vitamin C, preventing infantile scurvy. Human breast milk contains sufficient vitamin C, if the mother has an adequate intake. Commercial milk is pasteurized, a heating process that destroys the natural vitamin C content of the milk. Scurvy is one of the accompanying diseases of malnutrition (other such micronutrient deficiencies are beriberi or pellagra) and thus is still widespread in areas of the world depending on external food aid. Although rare, there are also documented cases of scurvy due to poor dietary choices by people living in industrialized nations. X-ray of the knee joint (arrow indicates scurvy line). Vitamins are essential to the production and use of enzymes that are involved in ongoing processes throughout the human body. Ascorbic acid is needed for a variety of biosynthetic pathways, by accelerating hydroxylation and amidation reactions. In the synthesis of collagen, ascorbic acid is required as a cofactor for prolyl hydroxylase and lysyl hydroxylase. These two enzymes are responsible for the hydroxylation of the proline and lysine amino acids in collagen. Hydroxyproline and hydroxylysine are important for stabilizing collagen by cross-linking the propeptides in collagen. Collagen is a primary structural protein in the human body, necessary for healthy blood vessels, muscle, skin, bone, cartilage, and other connective tissues. Defective connective tissue leads to fragile capillaries, resulting in abnormal bleeding, bruising, and internal hemorrhaging. Collagen is an important part of bone, so bone formation is also affected. Teeth loosen, bones break more easily, and once-healed breaks may recur. Defective collagen fibrillogenesis impairs wound healing. Untreated scurvy is invariably fatal. Diagnosis typically is based on physical signs, X-rays, and improvement after treatment. Scurvy can be prevented by a diet that includes vitamin C-rich foods such as amla, bell peppers (sweet peppers), blackcurrants, broccoli, chili peppers, guava, kiwifruit, and parsley. Other sources rich in vitamin C are fruits such as lemons, limes, oranges, papaya, and strawberries. It is also found in vegetables, such as brussels sprouts, cabbage, potatoes, and spinach. Some fruits and vegetables not high in vitamin C may be pickled in lemon juice, which is high in vitamin C. Though redundant in the presence of a balanced diet, various nutritional supplements are available that provide ascorbic acid well in excess of that required to prevent scurvy. Some animal products, including liver, muktuk (whale skin), oysters, and parts of the central nervous system, including the adrenal medulla, brain, and spinal cord, contain large amounts of vitamin C, and can even be used to treat scurvy. Fresh meat from animals which make their own vitamin C (which most animals do) contains enough vitamin C to prevent scurvy, and even partly treat it. In some cases (notably French soldiers eating fresh horse meat), it was discovered that meat alone, even partly cooked meat, could alleviate scurvy. Conversely, in other cases, a meat-only diet could cause scurvy. Scott's 1902 Antarctic expedition used lightly fried seal meat and liver, whereby complete recovery from incipient scurvy was reported to have taken less than two weeks. Scurvy will improve with doses of vitamin C as low as 10 mg per day though doses of around 100 mg per day are typically recommended. Hippocrates documented scurvy as a disease, and Egyptians have recorded its symptoms as early as 1550 BCE. The knowledge that consuming foods containing vitamin C is a cure for scurvy has been repeatedly rediscovered and forgotten into the early 20th century. In the 13th century, the Crusaders frequently suffered from scurvy. In the 1497 expedition of Vasco da Gama, the curative effects of citrus fruit were already known and confirmed by Pedro Álvares Cabral and his crew in 1507. The Portuguese planted fruit trees and vegetables in Saint Helena, a stopping point for homebound voyages from Asia, and left their sick, who had scurvy and other ailments, to be taken home by the next ship if they recovered. In 1500, one of the pilots of Cabral's fleet bound for India noted that in Malindi, its king offered the expedition fresh supplies such as lambs, chickens, and ducks, along with lemons and oranges, due to which "some of our ill were cured of scurvy". Unfortunately, these travel accounts did not stop further maritime tragedies caused by scurvy, first because of the lack of communication between travelers and those responsible for their health, and because fruits and vegetables could not be kept for long on ships. In 1536, the French explorer Jacques Cartier, exploring the St. Lawrence River, used the local natives' knowledge to save his men who were dying of scurvy. He boiled the needles of the arbor vitae tree (Eastern White Cedar) to make a tea that was later shown to contain 50 mg of vitamin C per 100 grams. Such treatments were not available aboard ship, where the disease was most common. In February 1601, Captain James Lancaster, while sailing to Sumatra, landed on the northern coast to specifically obtain lemons and oranges for his crew to stop scurvy. Captain Lancaster conducted an experiment using four ships under his command. One ship's crew received routine doses of lemon juice while the other three ships did not receive any such treatment. As a result, members of the non-treated ships started to contract scurvy, with many dying as a result. During the Age of Exploration (between 1500 and 1800), it has been estimated that scurvy killed at least two million sailors. Jonathan Lamb wrote: "In 1499, Vasco da Gama lost 116 of his crew of 170; In 1520, Magellan lost 208 out of 230;...all mainly to scurvy." In 1579, the Spanish friar and physician Agustin Farfán published a book in which he recommended oranges and lemons for scurvy, a remedy that was already known in the Spanish Navy. In 1593, Admiral Sir Richard Hawkins advocated drinking orange and lemon juice as a means of preventing scurvy. In 1614, John Woodall, Surgeon General of the East India Company, published The Surgion's Mate as a handbook for apprentice surgeons aboard the company's ships. He repeated the experience of mariners that the cure for scurvy was fresh food or, if not available, oranges, lemons, limes, and tamarinds. He was, however, unable to explain the reason why, and his assertion had no impact on the opinions of the influential physicians who ran the medical establishment that scurvy was a digestive complaint. A 1707 handwritten book by Mrs. Ebot Mitchell, discovered in a house in Hasfield, Gloucestershire, contains a "Recp.t for the Scurvy" that consisted of extracts from various plants mixed with a plentiful supply of orange juice, white wine or beer. In 1734, the Leiden-based physician Johann Bachstrom published a book on scurvy in which he stated, "scurvy is solely owing to a total abstinence from fresh vegetable food, and greens; which is alone the primary cause of the disease", and urged the use of fresh fruit and vegetables as a cure. Unfortunately, the experiment and its results occupied only a few paragraphs in a work that was long and complex and had little impact. Lind himself never actively promoted lemon juice as a single 'cure'. He shared medical opinion at the time that scurvy had multiple causes – notably hard work, bad water, and the consumption of salt meat in a damp atmosphere which inhibited healthful perspiration and normal excretion – and therefore required multiple solutions. Lind was also sidetracked by the possibilities of producing a concentrated 'rob' of lemon juice by boiling it. Unfortunately this process destroyed the vitamin C and was therefore unsuccessful. During the 18th century, disease killed more British sailors than enemy action. It was mainly by scurvy that George Anson, in his celebrated voyage of 1740–1744, lost nearly two-thirds of his crew (1,300 out of 2,000) within the first 10 months of the voyage. The Royal Navy enlisted 184,899 sailors during the Seven Years' War; 133,708 of these were "missing" or died from disease, and scurvy was the leading cause. Although throughout this period sailors and naval surgeons were increasingly convinced that citrus fruits could cure scurvy, the classically trained physicians who ran the medical establishment dismissed this evidence as mere anecdote which did not conform to current theories of disease. Literature championing the cause of citrus juice, therefore, had no practical impact. Medical theory was based on the assumption that scurvy was a disease of internal putrefaction brought on by faulty digestion caused by the hardships of life at sea and the naval diet. Although this basic idea was given different emphases by successive theorists, the remedies they advocated (and which the navy accepted) amounted to little more than the consumption of 'fizzy drinks' to activate the digestive system, the most extreme of which was the regular consumption of 'elixir of vitriol' – sulphuric acid taken with spirits and barley water, and laced with spices. In 1764, a new variant appeared. Advocated by Dr David MacBride and Sir John Pringle, Surgeon General of the Army and later President of the Royal Society, this idea was that scurvy was the result of a lack of 'fixed air' in the tissues which could be prevented by drinking infusions of malt and wort whose fermentation within the body would stimulate digestion and restore the missing gases. These ideas received wide and influential backing, when James Cook set off to circumnavigate the world (1768–1771) in HM Bark Endeavour, malt and wort were top of the list of the remedies he was ordered to investigate. The others were beer, sour crout and Lind's 'rob'. The list did not include lemons. Cook did not lose a single man to scurvy, and his report came down in favour of malt and wort, although it is now clear that the reason for the health of his crews on this and other voyages was Cook's regime of shipboard cleanliness, enforced by strict discipline, as well as frequent replenishment of fresh food and greenstuffs. Another rule implemented by Cook was his prohibition of the consumption of salt fat skimmed from the ship's copper boiling pans, then a common practice in the Navy. In contact with air, the copper formed compounds that prevented the absorption of vitamins by the intestines. The first major long distance expedition that experienced virtually no scurvy was that of the Spanish naval officer Alessandro Malaspina, 1789–1794. Malaspina's medical officer, Pedro González, was convinced that fresh oranges and lemons were essential for preventing scurvy. Only one outbreak occurred, during a 56-day trip across the open sea. Five sailors came down with symptoms, one seriously. After three days at Guam all five were healthy again. Spain's large empire and many ports of call made it easier to acquire fresh fruit. Although towards the end of the century MacBride's theories were being challenged, the medical establishment in Britain remained wedded to the notion that scurvy was a disease of internal 'putrefaction' and the Sick and Hurt Board, run by administrators, felt obliged to follow its advice. Within the Royal Navy, however, opinion – strengthened by first-hand experience of the use of lemon juice at the siege of Gibraltar and during Admiral Rodney's expedition to the Caribbean – had become increasingly convinced of its efficacy. This was reinforced by the writings of experts like Gilbert Blane and Thomas Trotter and by the reports of up-and-coming naval commanders. With the coming of war in 1793, the need to eliminate scurvy acquired a new urgency. But the first initiative came not from the medical establishment but from the admirals. Ordered to lead an expedition against Mauritius, Rear Admiral Gardner was uninterested in the wort, malt and elixir of vitriol which were still being issued to ships of the Royal Navy, and demanded that he be supplied with lemons, to counteract scurvy on the voyage. Members of the Sick and Hurt Board, recently augmented by two practical naval surgeons, supported the request, and the Admiralty ordered that it be done. There was, however, a last minute change of plan. The expedition against Mauritius was cancelled. On 2 May 1794, only HMS Suffolk and two sloops under Commodore Peter Rainier sailed for the east with an outward bound convoy, but the warships were fully supplied with lemon juice and the sugar with which it had to be mixed. Then in March 1795, came astonishing news. Suffolk had arrived in India after a four-month voyage without a trace of scurvy and with a crew that was healthier than when it set out. The effect was immediate. Fleet commanders clamoured also to be supplied with lemon juice, and by June the Admiralty acknowledged the groundswell of demand in the navy had agreed to a proposal from the Sick and Hurt Board that lemon juice and sugar should in future be issued as a daily ration to the crews of all warships. It took a few years before the method of distribution to all ships in the fleet had been perfected and the supply of the huge quantities of lemon juice required to be secured, but by 1800, the system was in place and functioning. This led to a remarkable health improvement among the sailors and consequently played a critical role in gaining the advantage in naval battles against enemies who had yet to introduce the measures. The surgeon-in-chief of Napoleon's army at the Siege of Alexandria (1801), Baron Dominique-Jean Larrey, wrote in his memoirs that the consumption of horse meat helped the French to curb an epidemic of scurvy. The meat was cooked but was freshly obtained from young horses bought from Arabs, and was nevertheless effective. This helped to start the 19th-century tradition of horse meat consumption in France. Lauchlin Rose patented a method used to preserve citrus juice without alcohol in 1867, creating a concentrated drink known as Rose's lime juice. The Merchant Shipping Act of 1867 required all ships of the Royal Navy and Merchant Navy to provide a daily lime ration to sailors to prevent scurvy. The product became nearly ubiquitous, hence the term "limey", first for British sailors, then for English immigrants within the former British colonies (particularly America, New Zealand and South Africa), and finally, in old American slang, all British people. The plant Cochlearia officinalis, also known as "Common Scurvygrass", acquired its common name from the observation that it cured scurvy, and it was taken on board ships in dried bundles or distilled extracts. Its very bitter taste was usually disguised with herbs and spices; however, this did not prevent scurvygrass drinks and sandwiches from becoming a popular fad in the UK until the middle of the nineteenth century, when citrus fruits became more readily available. West Indian limes began to supplement lemons, when Spain's alliance with France against Britain in the Napoleonic Wars made the supply of Mediterranean lemons problematic, and because they were more easily obtained from Britain's Caribbean colonies and were believed to be more effective because they were more acidic. It was the acid, not the (then-unknown) Vitamin C that was believed to cure scurvy. In fact, the West Indian limes were significantly lower in Vitamin C than the previous lemons and further were not served fresh but rather as lime juice, which had been exposed to light and air, and piped through copper tubing, all of which significantly reduced the Vitamin C. Indeed, a 1918 animal experiment using representative samples of the Navy and Merchant Marine's lime juice showed that it had virtually no antiscorbutic power at all. The belief that scurvy was fundamentally a nutritional deficiency, best treated by consumption of fresh food, particularly fresh citrus or fresh meat, was not universal in the 19th and early 20th centuries, and thus sailors and explorers continued to suffer from scurvy into the 20th century. For example, the Belgian Antarctic Expedition of 1897–1899 became seriously affected by scurvy when its leader, Adrien de Gerlache, initially discouraged his men from eating penguin and seal meat. In the Royal Navy's Arctic expeditions in the 19th century it was widely believed that scurvy was prevented by good hygiene on board ship, regular exercise, and maintaining the morale of the crew, rather than by a diet of fresh food. Navy expeditions continued to be plagued by scurvy even while fresh (not jerked or tinned) meat was well known as a practical antiscorbutic among civilian whalers and explorers in the Arctic. Even cooking fresh meat did not entirely destroy its antiscorbutic properties, especially as many cooking methods failed to bring all the meat to high temperature. increased marine speed via steam shipping, and improved nutrition on land, reduced the incidence of scurvy – and thus the ineffectiveness of copper-piped lime juice compared to fresh lemons was not immediately revealed. In the resulting confusion, a new hypothesis was proposed, following the new germ theory of disease – that scurvy was caused by ptomaine, a waste product of bacteria, particularly in tainted tinned meat. Infantile scurvy emerged in the late 19th century because children were being fed pasteurized cow's milk, particularly in the urban upper class. While pasteurization killed bacteria, it also destroyed vitamin C. This was eventually resolved by supplementing with onion juice or cooked potatoes. By the early 20th century, when Robert Falcon Scott made his first expedition to the Antarctic (1901–1904), the prevailing theory was that scurvy was caused by "ptomaine poisoning", particularly in tinned meat. However, Scott discovered that a diet of fresh meat from Antarctic seals cured scurvy before any fatalities occurred. In 1907, an animal model which would eventually help to isolate and identify the "antiscorbutic factor" was discovered. Axel Holst and Theodor Frølich, two Norwegian physicians studying shipboard beriberi contracted by ship's crews in the Norwegian Fishing Fleet, wanted a small test mammal to substitute for the pigeons then used in beriberi research. They fed guinea pigs their test diet of grains and flour, which had earlier produced beriberi in their pigeons, and were surprised when classic scurvy resulted instead. This was a serendipitous choice of animal. Until that time, scurvy had not been observed in any organism apart from humans and had been considered an exclusively human disease. Certain birds, mammals, and fish are susceptible to scurvy, but pigeons are unaffected, since they can synthesize ascorbic acid internally. Holst and Frølich found they could cure scurvy in guinea pigs with the addition of various fresh foods and extracts. This discovery of an animal experimental model for scurvy, which was made even before the essential idea of "vitamins" in foods had been put forward, has been called the single most important piece of vitamin C research. In 1915, New Zealand troops in the Gallipoli Campaign had a lack of vitamin C in their diet which caused many of the soldiers to contract scurvy. It is thought that scurvy is one of many reasons that the Allied attack on Gallipoli failed. Vilhjalmur Stefansson, an arctic explorer who had lived among the Inuit, proved that the all-meat diet they consumed did not lead to vitamin deficiencies. He participated in a study in New York's Bellevue Hospital in February 1928, where he and a companion ate only meat for a year while under close medical observation, yet remained in good health. In 1927, Hungarian biochemist Szent-Györgyi isolated a compound he called "hexuronic acid". Szent-Györgyi suspected hexuronic acid, which he had isolated from adrenal glands, to be the antiscorbutic agent, but he could not prove it without an animal-deficiency model. In 1932, the connection between hexuronic acid and scurvy was finally proven by American researcher Charles Glen King of the University of Pittsburgh. King's laboratory was given some hexuronic acid by Szent-Györgyi and soon established that it was the sought-after anti-scorbutic agent. Because of this, hexuronic acid was subsequently renamed ascorbic acid. Rates of scurvy in most of the world are low. Those most commonly affected are malnourished people in the developing world and the homeless. There have been outbreaks of the condition in refugee camps. Case reports in the developing world of those with poorly healing wounds have occurred. Notable human dietary studies of experimentally induced scurvy have been conducted on conscientious objectors during World War II in Britain and on Iowa state prisoner volunteers in the late 1960s. These studies both found that all obvious symptoms of scurvy previously induced by an experimental scorbutic diet with extremely low vitamin C content could be completely reversed by additional vitamin C supplementation of only 10 mg per day. In these experiments, no clinical difference was noted between men given 70 mg vitamin C per day (which produced blood levels of vitamin C of about 0.55 mg/dl, about ​1⁄3 of tissue saturation levels), and those given 10 mg per day (which produced lower blood levels). Men in the prison study developed the first signs of scurvy about 4 weeks after starting the vitamin C-free diet, whereas in the British study, six to eight months were required, possibly because the subjects were pre-loaded with a 70 mg/day supplement for six weeks before the scorbutic diet was fed. Men in both studies, on a diet devoid or nearly devoid of vitamin C, had blood levels of vitamin C too low to be accurately measured when they developed signs of scurvy, and in the Iowa study, at this time were estimated (by labeled vitamin C dilution) to have a body pool of less than 300 mg, with daily turnover of only 2.5 mg/day. The vast majority of animals and plants are able to synthesize vitamin C, through a sequence of enzyme-driven steps, which convert monosaccharides to vitamin C. However, some mammals have lost the ability to synthesize vitamin C, notably simians and tarsiers. These make up one of two major primate suborders, haplorrhini, and this group includes humans. The strepsirrhini (non-tarsier prosimians) can make their own vitamin C, and these include lemurs, lorises, pottos, and galagos. Ascorbic acid is also not synthesized by at least two species of caviidae, the capybara and the guinea pig. There are known species of birds and fish that do not synthesize their own Vitamin C. All species that do not synthesize ascorbate require it in the diet. Deficiency causes scurvy in humans, and somewhat similar symptoms in other animals. Animals that can contract scurvy all lack the L-gulonolactone oxidase (GULO) enzyme, which is required in the last step of vitamin C synthesis. The genomes of these species contain GULO as pseudogenes, which serve as insight into the evolutionary past of the species. In babies, scurvy is sometimes referred to as Barlow's disease, named after Thomas Barlow, a British physician who described it in 1883. However, Barlow's disease or Barlow's syndrome may also refer to mitral valve prolapse, first described by John Brereton Barlow in 1966. ^ a b c d e f g h i j k "Scurvy". GARD. 1 September 2016. Archived from the original on 26 January 2017. Retrieved 26 September 2016. ^ a b c d e f g h i j k l m n o p q r s Agarwal, A; Shaharyar, A; Kumar, A; Bhat, MS; Mishra, M (June 2015). "Scurvy in pediatric age group - A disease often forgotten?". Journal of Clinical Orthopaedics and Trauma. 6 (2): 101–7. doi:10.1016/j.jcot.2014.12.003. PMC 4411344. PMID 25983516. ^ "Vitamin C". Office of Dietary Supplements. 11 February 2016. Archived from the original on 30 July 2017. Retrieved 18 July 2017. ^ Renzaho, Andre M. N. (2016). Globalisation, Migration and Health: Challenges and Opportunities. World Scientific. p. 94. ISBN 978-1-78326-889-4. Archived from the original on 8 September 2017. ^ Toler, Pamela D. (2012). Mankind: The Story of All of Us. Running Press. p. 296. ISBN 978-0762447176. Archived from the original on 8 September 2017. ^ a b c d e f g h i Price, Catherine (2017). "The Age of Scurvy". Distillations. Vol. 3 no. 2. pp. 12–23. Retrieved April 17, 2018. ^ a b Hemilä, Harri (29 May 2012). "A Brief History of Vitamin C and its Deficiency, Scurvy". Archived from the original on 9 July 2014. Retrieved 25 May 2014. ^ Lynne Goebel, MD. "Scurvy Clinical Presentation". Medscape Reference. Archived from the original on 23 June 2011. ^ Hampl JS, Taylor CA, Johnston CS (2004). "Vitamin C deficiency and depletion in the United States: the Third National Health and Nutrition Examination Survey, 1988 to 1994". American Journal of Public Health. 94 (5): 870–5. doi:10.2105/AJPH.94.5.870. PMC 1448351. PMID 15117714. ^ WHO (4 June 2001). "Area of work: nutrition. Progress report 2000" (PDF). Archived from the original (PDF) on 16 December 2006. ^ Davies IJ, Temperley JM (1967). 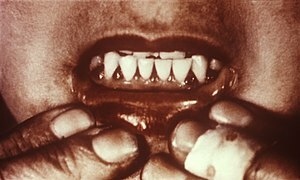 "A case of scurvy in a student". Postgraduate Medical Journal. 43 (502): 549–50. doi:10.1136/pgmj.43.502.539. PMC 2466190. PMID 6074157. ^ Sthoeger ZM, Sthoeger D (1991). "[Scurvy from self-imposed diet]". Harefuah (in Hebrew). 120 (6): 332–3. PMID 1879769. ^ Ellis CN, Vanderveen EE, Rasmussen JE (1984). "Scurvy. A case caused by peculiar dietary habits". Archives of Dermatology. 120 (9): 1212–4. doi:10.1001/archderm.120.9.1212. PMID 6476860. ^ McKenna KE, Dawson JF (1993). "Scurvy occurring in a teenager". Clinical and Experimental Dermatology. 18 (1): 75–7. doi:10.1111/j.1365-2230.1993.tb00976.x. PMID 8440062. ^ Feibel, Carrie (15 August 2016). "The Return of Scurvy? Houston Neurologist Diagnoses Hundreds of Patients with Vitamin Deficiencies". Houston Public Media. University of Houston. Archived from the original on 16 August 2016. Retrieved 2016-08-17. ^ "Forgotten Knowledge: The Science of Scurvy". Archived from the original on 10 May 2016. Retrieved 29 April 2016. ^ Rivers, JM (1987). "Safety of high-level vitamin C ingestion". Annals of the New York Academy of Sciences. 498 (1 Third Confere): 445–54. doi:10.1111/j.1749-6632.1987.tb23780.x. PMID 3304071. ^ Croucher, Martin (19 September 2012). "Dubai boy, 4, suffers scurvy after meat-only diet". The National (Abu Dhabi). Archived from the original on 23 September 2012. Retrieved 5 October 2012. ^ Scott, R.F. (1905). The Voyage of the Discovery. London. pp. 541–545. [26 September 1902] [The expedition members] Heald, Mr. Ferrar, and Cross have very badly swollen legs, whilst Heald's are discoloured as well. The remainder of the party seem fairly well, but not above suspicion; Walker's ankles are slightly swollen. [15 October 1902] [After a fresh seal meat diet at base camp] within a fortnight of the outbreak there is scarcely a sign of it remaining [...] Heald's is the only case that hung at all [...] and now he is able to get about once more. Cross's recovery was so rapid that he was able to join the seal-killing party last week. ^ Manual of Nutritional Therapeutics. Lippincott Williams & Wilkins. 2008. p. 161. ISBN 9780781768412. ^ Stone I (1966). "On the genetic etiology of scurvy". Acta Geneticae Medicae et Gemellologiae (Roma). 15 (4): 345–50. PMID 5971711. Archived from the original on 10 February 2008. ^ Bradley S, Buckler MD, Anjali Parish MD (2018-08-27). "Scurvy". EMedicine. Archived from the original on 12 February 2010. ^ Jacques Cartier's Second Voyage Archived 12 February 2007 at the Wayback Machine, 1535 Winter & Scurvy. ^ Martini E (2002). "Jacques Cartier witnesses a treatment for scurvy". Vesalius. 8 (1): 2–6. PMID 12422875. ^ Brown, Mervyn. A history of Madagascar. p. 34. ^ Rogers, Everett. Diffusion of Innovations. p. 7. ^ Drymon, M. M. (2008). Disguised As the Devil: How Lyme Disease Created Witches and Changed History. Wythe Avenue Press. p. 114. ISBN 978-0-615-20061-3. Archived from the original on 15 May 2016. ^ Lamb, Jonathan (2001). Preserving the self in the south seas, 1680–1840. University of Chicago Press. p. 117. ISBN 978-0-226-46849-5. Archived from the original on 24 June 2016. ^ "El descubrimiento español de la cura del escorbuto". 2018-02-27. ^ Kerr, Gordon (2009). Timeline of Britain. Canary Press. ^ Bown, Stephen R (2003). Scurvy: How a Surgeon, a Mariner and a Gentleman Solved the Greatest Medical Mystery of the Age of Sail. New York: Viking. ISBN 978-0-312-31391-3. ^ "Cure for Scurvy discovered by a woman". The Daily Telegraph. 5 March 2009. Archived from the original on 25 January 2016. ^ Bartholomew, Michael (2002). "James Lind and scurvy: A revaluation". Journal for Maritime Research. 4 (1): 1–14. doi:10.1080/21533369.2002.9668317. PMID 20355298. ^ "The Blood of Nelson" by Glenn Barnett — Military History — Oct 2006. ^ Baron, Jeremy Hugh (2009). "Sailors' scurvy before and after James Lind - a reassessment". Nutrition Reviews. 67 (6): 315–332. doi:10.1111/j.1753-4887.2009.00205.x. PMID 19519673. ^ Bartholomew, M (Jan 2002). "James Lind and Scurvy: a Revaluation". Journal for Maritime Research. ^ Vale and Edwards (2011). Physician to the Fleet; the Life and Times of Thomas Trotter 1760-1832. Woodbridge: The Boydell Press. pp. 29–33. ISBN 978 1 84383 604 9. ^ Stubbs, B. J. (2003). "Captain Cook's Beer; the anti-scorbutic effects of malt and beer in late 18th century sea voyages". Asia and Pacific Journal of Clinical Nutrition. 12 (2): 129–37. PMID 12810402. ^ Fernandez-Armesto, Felipe (2006). Pathfinders: A Global History of Exploration. W.W. Norton & Company. p. 297. ISBN 978-0-393-06259-5. ^ BBC — History — Captain Cook and the Scourge of Scurvy Archived 3 March 2009 at the Wayback Machine. ^ Fernandez-Armesto, Felipe (2006). Pathfinders: A Global History of Exploration. W.W. Norton & Company. pp. 297–298. ISBN 978-0-393-06259-5. ^ Thomas Trotter; Francis Milman (1786). 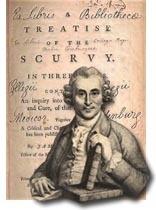 Observations on the Scurvy: With a Review of the Theories Lately Advanced on that Disease ; and the Opinions of Dr Milman Refuted from Practice. Charles Elliott and G.G.J. and J. Robinson, London. Archived from the original on 8 September 2017. ^ Vale, Brian (2008). "The Conquest of Scurvy in the Royal Navy 1793–1800: a Challenge to Current Orthodoxy". The Mariner's Mirror. 94 (2): 160–175. doi:10.1080/00253359.2008.10657052. ^ Larrey is quoted in French by Dr. Béraud, Études Hygiéniques de la chair de cheval comme aliment Archived 4 March 2016 at the Wayback Machine, Musée des Familles (1841-42). ^ Simpson, J.; Weiner, E. (1989). The Oxford English Dictionary. Oxford University Press. ^ Mabey, Richard (1972). Food for free. Collins. pp. 93, 94. ISBN 978-0-00-724768-4. ^ Scott, Robert F. (1905). The Voyage of the Discovery. London: Smith, Elder & Co. p. 556. [no] party wintering in the Antarctic Regions will have great difficulty in providing themselves with fresh food; and, as we have proved, where such conditions exist there need be no fear of the dreaded word 'scurvy'. ^ Norum KR, Grav HJ (June 2002). "[Axel Holst and Theodor Frølich--pioneers in the combat of scurvy]". Journal of the Norwegian Medical Association. 122 (17): 1686–7. PMID 12555613. ^ McClellan Walter S., Du Bois Eugene F. (1930). "Prolonged meat diet experiment" (PDF). J Biol Chem. 87: 651–668. Archived (PDF) from the original on 1 January 2016. ^ Carpenter, Kenneth J. (22 June 2004). "The Nobel Prize and the Discovery of Vitamins". nobelprize.org. Nobel Foundation. Archived from the original on 24 February 2008. Retrieved 2008-01-25. ^ "The Albert Szent-Gyorgyi Papers Szeged, 1931-1947: Vitamin C, Muscles, and WWII". nlm.nih.gov. U.S. National Library of Medicine. Archived from the original on 24 October 2007. Retrieved 2008-01-25. ^ Moser, MA; Chun, OK (12 August 2016). "Vitamin C and Heart Health: A Review Based on Findings from Epidemiologic Studies". International Journal of Molecular Sciences. 17 (8): 1328. doi:10.3390/ijms17081328. PMC 5000725. PMID 27529239. ^ Khonsari, H; Grandière-Perez, L; Caumes, E (November 2005). "[Scurvy, a re-emerging disease]". La Revue de Medecine Interne. 26 (11): 885–90. doi:10.1016/j.revmed.2005.03.007. PMID 15949874. ^ Mason, JB (July 2002). "Lessons on nutrition of displaced people". The Journal of Nutrition. 132 (7): 2096S–2103S. doi:10.1093/jn/132.7.2096s. PMID 12097702. ^ "Surprise scurvy cases suggest nutrient deficiencies, even amongst the obese". Westmead Institute for Medical Research. 28 November 2016. Archived from the original on 23 August 2017. Retrieved 2017-08-23. ^ a b Pemberton, J. (2006). "Medical experiments carried out in Sheffield on conscientious objectors to military service during the 1939–45 war". International Journal of Epidemiology. 35 (3): 556–558. doi:10.1093/ije/dyl020. PMID 16510534. ^ a b Hodges, R. E.; Baker, E. M.; Hood, J.; Sauberlich, H. E.; March, S. C. (1969). "Experimental Scurvy in Man". American Journal of Clinical Nutrition. 22 (5): 535–548. doi:10.1093/ajcn/22.5.535. PMID 4977512. Archived from the original on 6 September 2008. ^ Miller RE, Fowler ME (July 31, 2014). Fowler's Zoo and Wild Animal Medicine, Volume 8. p. 389. ISBN 9781455773992. Archived from the original on December 7, 2016. Retrieved June 2, 2016. ^ Cueto GR, Allekotte R, Kravetz FO (2000). "[Scurvy in capybaras bred in captivity in Argentine.]". Journal of Wildlife Diseases. 36 (1): 97–101. doi:10.7589/0090-3558-36.1.97. PMID 10682750. Archived from the original on 3 August 2012. ^ "Vitamin C". Food Standards Agency (UK). Archived from the original on 1 July 2006. Retrieved 2007-02-19. ^ "Vitamin C". University of Maryland Medical Center. January 2007. Archived from the original on 12 April 2008. Retrieved 2008-03-31. ^ Higdon, Jane, Ph.D. (31 January 2006). "Vitamin C". Oregon State University, Micronutrient Information Center. Archived from the original on 6 March 2007. Retrieved 2007-03-07. ^ Nishikimi M, Yagi K (December 1991). "Molecular basis for the deficiency in humans of gulonolactone oxidase, a key enzyme for ascorbic acid biosynthesis". The American Journal of Clinical Nutrition. 54 (6 Suppl): 1203S–1208S. doi:10.1093/ajcn/54.6.1203s. PMID 1962571. ^ Nishikimi M, Kawai T, Yagi K (October 1992). "Guinea pigs possess a highly mutated gene for L-gulono-gamma-lactone oxidase, the key enzyme for L-ascorbic acid biosynthesis missing in this species". The Journal of Biological Chemistry. 267 (30): 21967–72. PMID 1400507. ^ Ohta Y, Nishikimi M (October 1999). "Random nucleotide substitutions in primate nonfunctional gene for L-gulono-gamma-lactone oxidase, the missing enzyme in L-ascorbic acid biosynthesis". Biochimica et Biophysica Acta. 1472 (1–2): 408–11. doi:10.1016/S0304-4165(99)00123-3. PMID 10572964. ^ Evans PR (December 1983). "Infantile scurvy: the centenary of Barlow's disease". British Medical Journal (Clinical Research Ed.). 287 (6408): 1862–3. doi:10.1136/bmj.287.6408.1862. PMC 1550031. PMID 6423046. ^ Carpenter, Kenneth J. (1988). The History of Scurvy and Vitamin C. Cambridge University Press. p. 172. ISBN 978-0-521-34773-0. ^ Barlow JB, Bosman CK (February 1966). "Aneurysmal protrusion of the posterior leaflet of the mitral valve. An auscultatory-electrocardiographic syndrome". American Heart Journal. 71 (2): 166–78. doi:10.1016/0002-8703(66)90179-7. PMID 4159172. Brown, Stephen R. Scurvy: How a Surgeon, a Mariner, and a Gentleman Solved the Greatest Medical Mystery of the Age of Sail. Carpenter, K.J. (1986). The History of Scurvy and Vitamin C. Cambridge. Cegłowski, Maciej (7 March 2010). "Scott and Scurvy". IdleWords.com. Wikimedia Commons has media related to Scurvy. "Scurvy (Scorbutus)". The Encyclopaedia Britannica; A Dictionary of Arts, Sciences, Literature and General Information. XXIV (SAINTE-CLAIRE DEVILLE to SHUTTLE) (11th ed.). Cambridge, England and New York: At the University Press. 1911. p. 517. Retrieved 22 October 2018 – via Internet Archive.